‘Where are you now?’ I am in Bengaluru. Ahh, it gives so much euphoria to say that I am a part of this beautiful city. People have problems and they often complain about traffic and other things but I just love this place. Life may take me out of Bengaluru but it cannot take Bengaluru out of me. There is no day where I have not enjoyed the vibes of this city. Every day seems like a new day despite having the same Masala Dose or sipping the same Filter coffee. Unlike most people out there, my love for Bengaluru is not limited only to its awesome weather. I have more reasons to say Why I love Bengaluru. I am not exaggerating. I have lived in Bengaluru spending Rs.2000 / month on my food and travel. There are so many food points where you can have a tummy-full meal within Rs.100 without compromising on the taste and quality. Well, it depends on your lifestyle and the locality where you stay however compared to other metro cities, cost of living is much better here. You should know that BMTC carries nearly 43 lakh people on a daily basis. Now, with a stronger metro connection, transport in the city has become much easier and convenient. This holds true to other metro cities as well but I love Bengaluru people for a reason that they will guide you like a friend. It so happened that I was looking for British library near Vidhana Soudha. A fellow person literally gave his 20 minutes, searching on a map, asking the nearby Autowalas to help me. Such an awesomeness! If you have traveled and lived in different cities then you will know this fact that Bengaluru is one of the safest cities for Women in India. I am not so proud of the certain incidents which happened in the past but still, Bengaluru can be considered as the safest for Women in India. Standup comedian Sumukhi Suresh, who moved to Bangalore from Chennai five years ago, feels safer here. “I have traveled back home in the middle of the night on my bike and nothing untoward has happened. People in Bangalore are more aware, so if I am being attacked by a knife-wielding man, people may not come to my defense, but they will at least scream and get other’s attention.” (Source: TOI). There is no day in the city where you find no cultural events happening. Every day, there will be one or the other events keeping the city engaged and hooked to art and literature. For an instance, take Rangashankara. This is a place where you see plays being played every day except Monday. Be it stand up comedy shows, talk shows, concerts or workshops, Bengaluru is heaven for art lovers. I need not have to exaggerate here as everyone out there agrees to the point that Bengaluru is a place made for foodies. From South Indian Idli, Vada, Dose to North Indian Dhabas to Italian and Continental cuisines, this city has an amazing food culture which you seldom see in other cities. Silicon City for a reason. Bengaluru is also known as a Start-up capital of the country. This is a city which has given birth to some of the most successful start-ups and businesses. The cosmopolitan culture of Bengaluru and the tech-friendly crowd has helped the city to achieve this feat. Bengaluru and Weekends have always made a great pair. The way this city has embraced the pub culture and the very way it gets down to the tunes of Saturday mood is truly amazing. I love parties and I Love My Bengaluru. Well, people say that Bengaluru is no more a Garden City but I still feel that this is the only metro city in India where you get to see so much of green around. Yes, there were thousands of lakes before and the city was way cooler than today but still, you should agree that there is no place like this where you find lakes and gardens inside the cityscape. You can hate things about Bengaluru but you find no reasons to hate Bengaluru people. Probably, this is the only city in India where you can live without knowing the state’s language (Kannada). People here are so awesome that they try to communicate in your language and one should really appreciate it. They are helpful, friendly, sometimes over-enthusiastic but still, Bengaluru people are the best. If Bengaluru is attracting such a large crowd then maximum share goes to the Career opportunity that the city provides. Bengaluru has the highest number of Engineering colleges, Management Institutes (including IIM), Start-ups and some of the World’s renowned companies. I love this city for a fact that it accommodates every discipline. If you are a passionate and hard-working person then Bengaluru will definitely help you to push your limits and move on. Coffee and Bengaluru has always made the best pair and the city is known for its mind-blowing taste of Caffeine, for years. You can hate things about Bengaluru but you can’t help yourself to love these three things – Bengaluru Weather, Bengaluru people, and Bengaluru Kaapi. Bengaluru has the most scintillating weekend spots around, that too within 500 km. Wish to go for breakfast ride places, wanting to take a road trip, looking to have a good time with your family; Bengaluru has them. Also, Bengaluru houses the maximum number of holy places maintaining a perfect religious harmony in the city. Yes, Bengaluru is not so overcrowded in comparison to other cities. You don’t feel like choked and jampacked here. This city gives that needed space for you and makes sure that you gel well with its color and hue. And, if you want to relocate, there are many companies in Bangalore who can help you in shifting. And Finally It rains in Summer Man! Is there any Metro city in India where you go home drenched in rain? That too in Summer? This city truly understands my pain. I feel the heat and crave for rain, Bengaluru just pours. On an average, the highest temperature in Bengaluru (2018) has not crossed 35-degree Celsius and its lowest was 28-degree Celsius. If you compare this to other metro cities like Delhi, Mumbai and Chennai then you understand why people adore so much about Bengaluru weather. So, now you know Why I Love Bangalore. Do you love Bengaluru? Great! Let me know the reasons in the comments below. 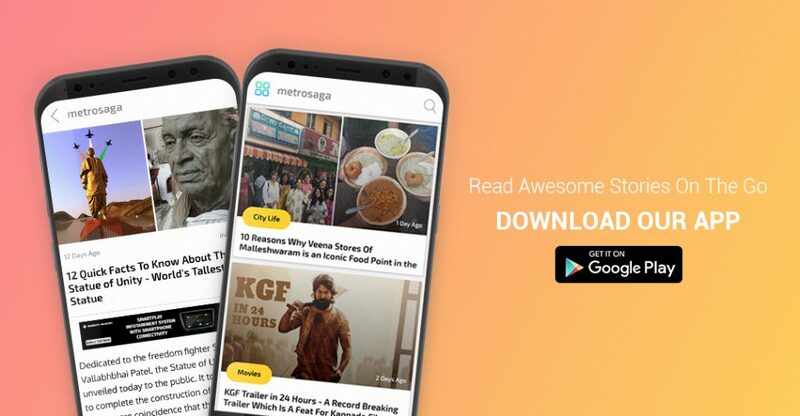 Like and follow MetroSaga on Facebook | Instagram for more on Bengaluru.